"Ward Marston has done a remarkable job in remastering these selections. Apparently they were recorded at a variety of speeds below 78rpm, and by bringing them to their proper speeds, he has eliminated the shrillness that I remember from the original 78s and their LP transfers. What we hear is vivid and lifelike, with an unforced vitality that is immediately appealing. Bori's voice was consistently well-focused, her technique was secure, and there is subtlety, precision, and musical sensitivity in her interpretations." 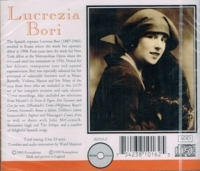 "Lucrezia Bori was one of the loveliest sopranos of her time, and yet during these recent years, when the recordings of her contemporaries have enjoyed a new lease of life on CD, hers have been largely neglected. Romophone's complete edition of the Victor series has now made amends, and this Gramophone  Award completes the job handsomely....the records...have come up wonderfully well in Ward Marston's transfers. She was a fascinating artist, patrician but very human, delicate yet possessed of an intense inner strength: not a singer to forget."